My husband Michael grew up in Lincoln Park. As a city kid, he proved his street cred through various urban adventures that included creating “street art”. We recently watched the documentary “Exit Through the Gift Shop”, a revealing inside account captured by a manic shop-keeper turned film-maker as he attempts to document the most infamous vandals including the faceless Banksy. How does street art translate into our everyday lives? 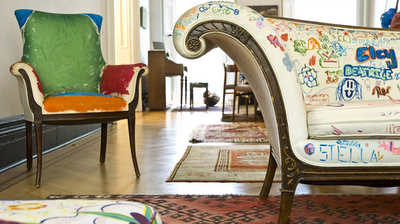 The world of art, fashion and home design consistently collide. For decades street fashion has influenced the runway and undoubtedly these trends make their way into our homes. 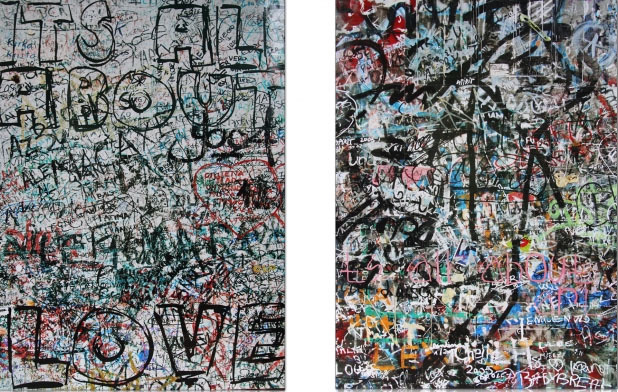 In the world of fashion, Stephen Sprouse designed a Graffiti Collection for Louis Vuitton first introduced in 2001. Marc Jacobs reinterpreted the collection with the graffiti and the rose in day glo shades of pink, green and orange. 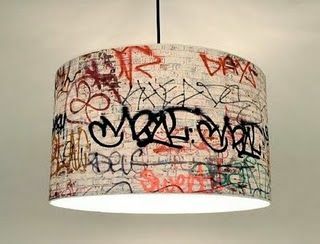 Graffitt’s hip, urban style brings a blend of sleek modernity and edginess to home décor. 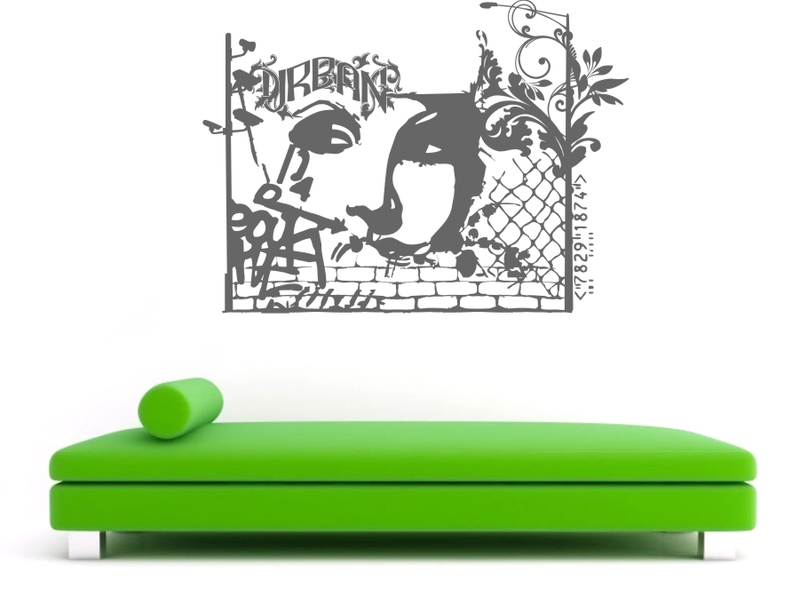 I put together a collection of graffiti inspired home products that I love- a cool pendant, art decals from Single Stone Studios and artwork and pillows from Chicago artist Matthew Lew. “It is all about Love & Art”, Matthew Lew, mixed media on canvas with a high gloss varnish. 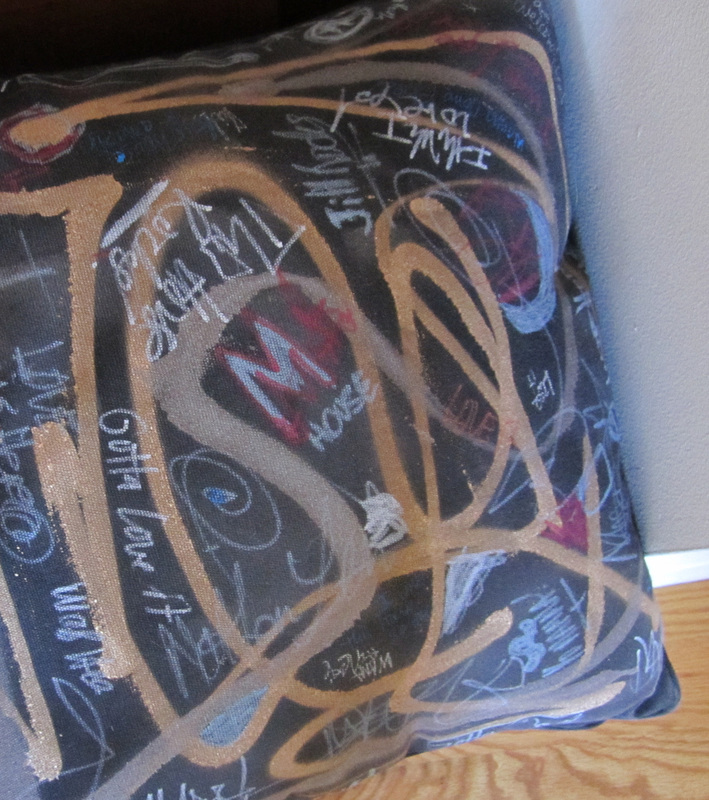 Outdoor pillow commission by Matthew Lew for my roof deck. I think the writing is on the walls- we will be seeing more of this trend in the future. Great post, Jilly! I love all of the images.